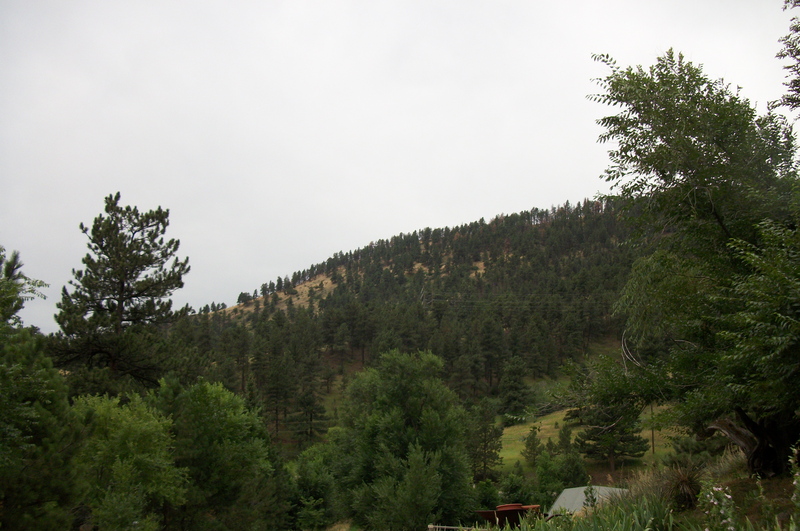 A couple of days ago I was in my car on my way to Crystal Springs Brewing Company in Boulder. As I made my way down (or is it up?) Sunshine Canyon Road, I was caught up in how absolutely beautiful that area is. Often when I’m going to a brewery, I find myself in an industrial area, where the only view is of storage units or perhaps a truck unloading its cargo. Not the case with Crystal Springs, as you can see from the photo. Crystal Springs is owned by Tom Horst, and all the brewing is currently done in his garage, so at the moment they have no tap room. That will soon change, however, as they are expected to open one in Louisville in the Colorado Tech Center. While there is no exact date yet, plans are to be open sometime in September. But tap room or not, Mr. Horst welcomed me, along with fellow beer blogger The Beer Drifter, to pay a visit and was a very gracious host. The brewery officially opened in May 2010. There are some local bars and restaurants that offer their beers on tap, such as The Corner Bar and Baker St. Pub in Boulder, and Lulu’s BBQ in Louisville. 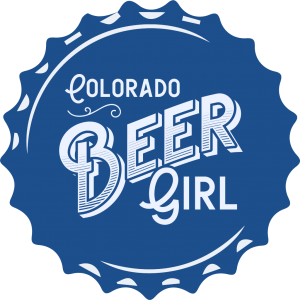 But I have never seen them on tap in Denver, so I hadn’t tried many of their brews before my trip there. The first one we got to try was Butch Pale Ale; named after Tom’s dad, this pale was nicely hopped (with Simcoe hops) yet extremely well balanced. It is a pale that an IPA-lover like me can really enjoy. The next was Marilyn Belgian-Style Golden Ale, this one named after his mother; I think it’s a truly wonderful gesture when I hear of beers whose names have a special familial meaning. 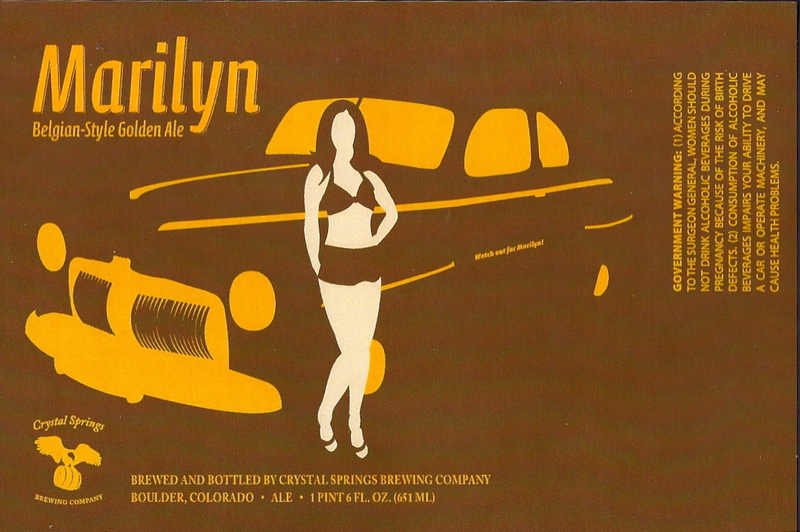 This beer was very easy to drink but, if you pay close attention to its label, you see it says, “Watch out for Marilyn!” Why? Well, you’d never know from its taste, but this beer weighs in at 9.2%, so it can definitely creep up on you! Our third beer was South Ridge Amber; I often find that ambers simply don’t have enough flavor for me, but this one certainly did. I was happy to find an amber I can actually drink! And then–Tom saved the best for last: Black Saddle Port Barrel Aged Imperial Stout. 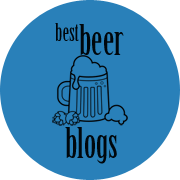 I already love Imperial Stouts AND barrel aged beers. This beer was nothing short of astounding. Extremely flavorful, not overly “strong” tasting for its ABV of 13%. And it’s all about ’13.’ “It was 13 months in development, took 13 days to ferment, spent 13 weeks in secondary, was then aged in port barrels for 13 months, titration took 113 minutes, and then bottle conditioned for 13 weeks. It will be released the 13th week of summer in very limited batches.” A true labor of love. I was so appreciative that he wanted to share this with us; it’s definitely not something I’m going to be offered every day (unfortunately for me)! 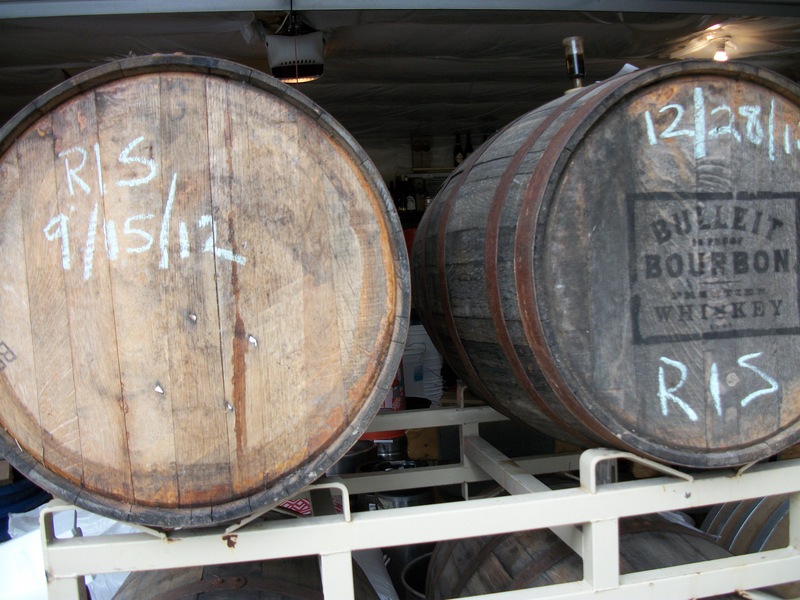 What’s the plan for these bourbon barrels…? It was a fantastic day of beer sampling, beer talk, and meeting great people, including Tom, his new brewer Colin, and James (aka The Beer Drifter). So what’s next for Crystal Springs? Well, the excitement of the Louisville tap room within the coming weeks–which is a big deal. And then there are these bourbon barrels here…wonder what’s going to fill those in the near future. 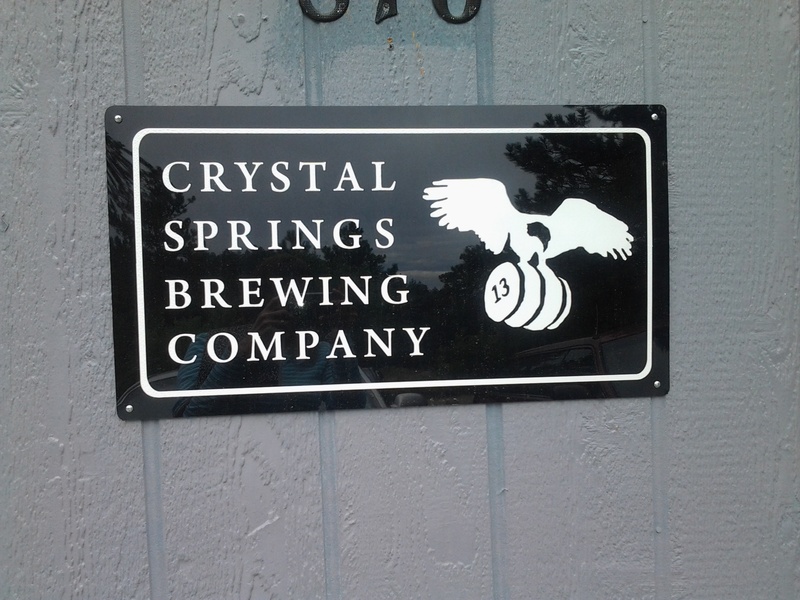 And one other point of interest: Crystal Springs chose its name based on the old Boulder City Brewery, founded in 1875, which later changed its name to Crystal Springs Brewing and Ice Company. The modern Crystal Springs would like to put out a beer that replicates one of the beers which used to be brewed over 100 years ago. 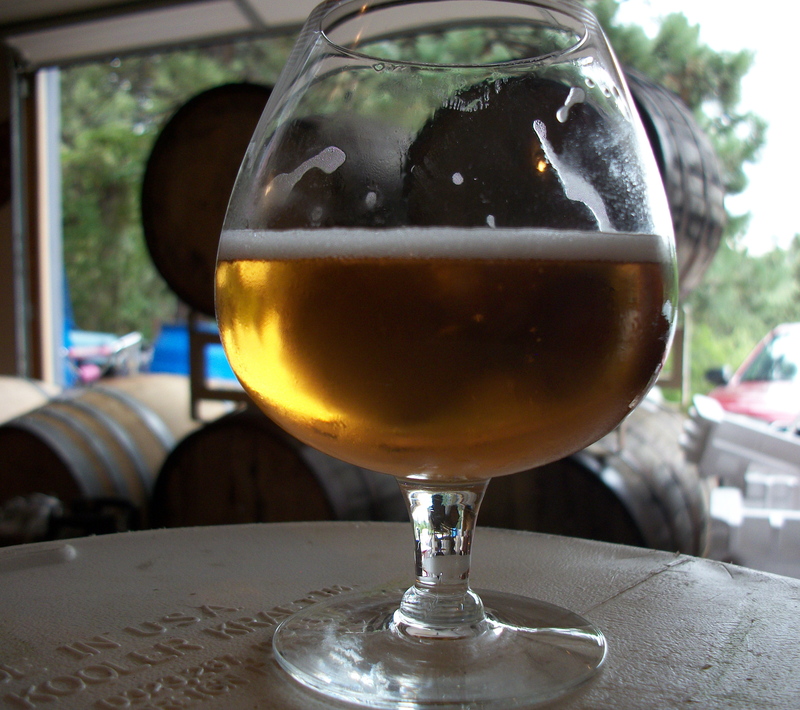 The hope is to release this beer (possibly a lager) sometime this fall. I love the idea of bringing back old styles with a modern twist. 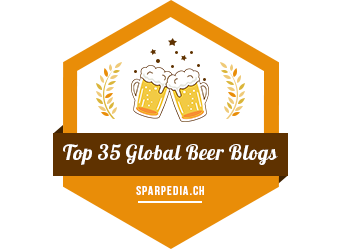 I genuinely thought all of the beers I tasted were very quality, excellent tasting beers. If you haven’t tried them out, I recommend doing so. They can be found in liquor stores such as Argonaut, Mr. B.’s, Liquormart, Hazel’s Beverage World, and more. And pay a visit to their tap room once they are open. You can sign up for their newsletter here. I’m so happy I got to visit and learn more about the brewery and its beers. I look forward to the tap room; I will see you there!